.... that recovery is hard. for me it might be harder then the labor. well they don't give you and epidural for the recovery part. i do feel good. put no one told me about "using the bathroom" after having a v-birth (i won't use the real word for the male audience, but lets face it we all came from the same place). that was the worst day ever for me. we have come out on the other side though and we are good. i could not have done it without the help of my mom who sat with BellaRose all day and for Becky who i got out of bed to come to my house. thank you all. it is so weird to have a day like that and then you come out and see this sweet little baby and i hold nothing against her or wish that we had never had a baby. the pain is nothing compared to the joy we have in this sweet bundle of joy. my mom has been a life saver for me. she has burped her and changed her diaper, cleaned the house. it has been amazing. thank you also to all our loving friends who want to come and hang out. again we will never be able to tell you how much you mean to us. my sister, kelly, came up yesterday while my mom went back to greenville for the day. it was so wonderful to hang out with her. thank you for lunch and the drive up here and back. we went for her one week check-up yesterday and she is already passed her birthweight. 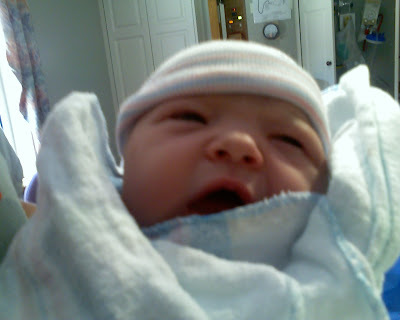 she is 8lbs 12.5 oz. she is so cute and chubby. that was our first outing and i think that it went pretty smoothly. i was pretty nervous about it. she is not the biggest fan of the carseat right now. she looks so tiny in it and scrunched up. well much more to come. just trying to figure out this whole mommy thing. thank you!!! thank you!!!! thank you!!! as i sit here and write this i am so overwhelmed with love. love for you, my friends and family who were so excited for worth and me. who came to the hospital, who called, who sent flowers and ballons, who prayed, who looked at pictures, and posted on blogs. you have loved us good and for that we are so thankful. i am also overwhelmed with such great love for this precious little girl that God has so graciously let us keep and love. i sit her crying b/c i am just overcome with so much emotion. i know that we waited for her and sometimes not so patiently on my part and on monday night she decided the time was right. we went into labor at about 9 that night, got to the hospital about 11:45 and my water broke in the parking lot of the hospital. 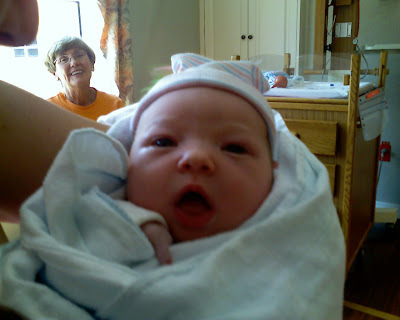 the epidural came at 3 that morning. after that we were smooth sailing and sweet girl came at 1:46 that afternoon. the people at the hospital were amazing and we all shared something so deep and great together. i will never know how to repay them or thank them. what an emotional time childbirth is. it is one of the best emperiences of my life and one of the hardest. this little girl is so amazing. she is sweet and gorgeous and i could eat her up. we are just so in love. worth is the most amazing dad. he loves her so deeply which makes me fall in love with him even more. i know i keep using the word love but what other word can i use at this time in my life. i just stare at her and can't believe that we made her. i have already cried about her growing up. 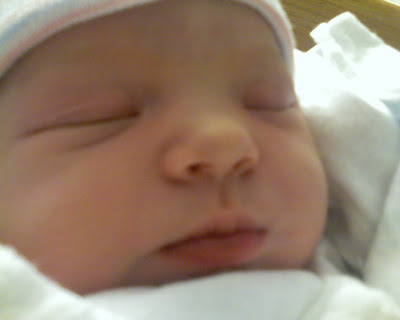 i want her to be 4 days old forever. i know that is not possible but this time when she is like this is so short. sorry i know that i am VERY emotional but i never thought that in a million years i would ever feel this way. thank you all, thank you friends, thank you family~ you are all one in the same for me~ amazing. worth and i love you so much and the outpouring you have shown us has not gone un-noticed and for that we are deeply humbled. 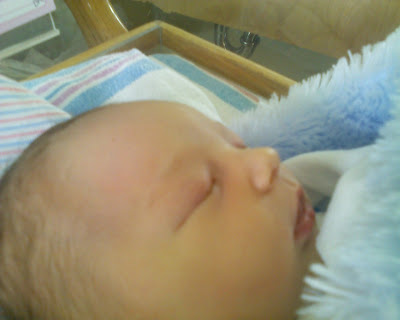 Here are a ton more pictures sorry I didn't post sooner I have been at the hospital all day I just could not get enough. BellaRose is just perfect! Worth and Sunday could not be happier. Niki and BellaRose already BFF! Don't you just want to kiss this precious little face! 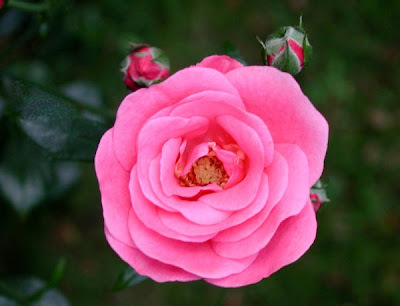 Roses for BellaRose from Worth's Parents who just adore their new grandaughter. I pulled up her sleeve to see these sweet tiny little fingers...so delicate. and posing, she is such a little beauty! Oh Rylie Jayne BellaRose got the balloons you sent she can't wait to meet you too! Here I am just so happy to be holding this beautiful child. She really is sooooo beautiful just like her Mommy! And tan too!!! Angela and I made her look like a little Eskimo. Good thing my flash didn't wake her up! Sunday is such a wonderful mom. I am soooo proud of her. This is trying to wake her up to feed her...it is hard because the girl loves some sleep, she has come such a long way to get here she seems pretty wiped out. She has such a sweet squeaky little cry, she kinda squeaks like Sunday! It's amazing. Thank you God for BellaRose. Thank you for bringing such joy and love into the lives of those that meet her. Thank you for Sunday and Worth and their new little family!!! HERE IS THE LATEST PICTURE SUNDAY SENT ME THIS MORNING. WHAT A SWEETHEART!!!! Here is another picture of our favorite girl. Sunday just sent me this one from her phone. I love Worth's mom's face in the background. I think in this shot she is totally looking like Sunday, ready to laugh and talk and hang out with the girls! As for the word on visiting Sunday felt it best to get her rest tonight so if you can take it please try to wait and visit tomorrow. I will let you know the room # soon. Jessica I totally am with you on wanting to go to the hospital and take loads of pictures but I must make myself wait until tomorrow! Sunday's words "Can you believe how big? isn't she perfect!" Everyone is healthy and happy Thank you God for our little BellaRose. WELL THE TIME HAS FINALLY ARRIVED AT 12:15 EARLY TUES MORNING MORE EXCITED THAN I HAVE EVER HEARD HIM SOUND, WORTH CALLED TO TELL ME THAT SUNDAY IS IN THE HOSPITAL AND BELLA ROSE IS ON HER WAY SHE IS IN LABOR AS I TYPE AND I AM SO EXCITED I KEEP MESSING UP! I WILL LET YOU KNOW AS SOON AS I HEAR ANYTHING MORE! KEEP PRAYING FOR THE GRANTS!!!! no baby, not much progress. we are still 1-2 cm diliated and 75% effaced, belly measuring at 37 cms, but i was having a contraction then too so probably not real accurate. the doctor feels like BellaRose is doing well and she has enough fluid around her. her heartbeat is good, we are having contractions, but no labor! we were at the doctor for 2 hours this morning having an ultra sound and the non stress test, which i thought was a little stressful b/c everytime you don't hear the heartbeat you get nervous. so we go to the hospital at 6 am on thursday the 24th to be induced. my doctor will deliver us and that makes me feel really good. we are in a bit of a shock right now, we have been preparing for this and now we know we will have a baby this weekend. it is all very surreal to us. so that will be a fun birthday for her the 24th, near memorial day. talk about trips to the lake and the beach. sounds fun! on saturday and sunday we went to the lake at camp and let the yellow dogs go swim and rainy jumped off the diving boards. there is nothing she won't do for a tennis ball. you can see sadie, annie and dan's dog, treading water below rainy. she really liked to tread water. we also had worth's mom's dog, elly, out there on sunday. there were so many yellow dogs it was hard to keep track, but rainy was the only one to go off the diving board. you can see her commitment. so what do you do when you are waiting for a baby do come? well, we, the grants, as in Worth and Sunday, replant our garden for the 3rd time. i dare those birds to come back again. we are armed and we are ready. of course now there are frost warnings and that may take us out now! worth also likes to chop wood. i asked him if he was angry about anything but he said "no" he just likes to chop wood. to each his own. 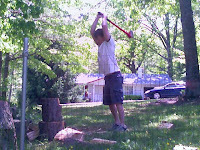 the tree he is chopping is the one that we cut down a couple of post ago. we also bought more plants and are trying to find places for them. 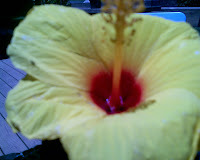 such as this beautiful yellow hibiscus we could not pass up. let me tell you all these were taken with the camera phone so they are not really the actual colors. this flower is such a bright yellow. so pretty! also when we are waiting for a baby to come we time contractions and think that we are getting really close, but in actuality it was nothing and i sit her still pregnant. you know this being pregnant has not been bad. i can't complain, but they just gave us a date to look forward to and it has come and gone and we are still in the same place. it gives me more time to get stretch marks and get bigger (think about the bigger picture sunday!). 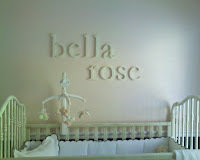 i have to show you these letters that we got for BellaRose's room. aren't they wonderful. thank you shelley for helping to contribute to the letters. i had been waiting for them and now we have them. i really like them a lot. worth had a real fun time putting them up too. i went out for a bagel and left him to it. 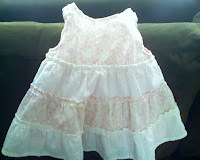 i also wanted to share this sweet little dress i bought from gymboree. it was only $12 and of course with shipping and tax and all that it came up to $20, but it was normally $32. i mean who could pass this up. it has pink bloomers too. now we just need a little person to fill it. please be praying this baby comes soon. people who i was ahead of in the pregnancy are starting and have been having their babies. i think it is time! no matter what you feel about the war in Iraq, it is war here in the Grant household. this war is waged over a garden. who has the rights to it, the robins, or us? this is serious folks. on monday we went and bought cucumbers, pickles, squash, more basil. the garden was filled, and we were thrilled. tuesday morning we went off on our walk (by the way walking DOES NOT work to get babies out) by the time we got home the whole right side of the garden was gone. "they" got them. "they" decided that squash, pumpkins, tomatoes, cucumbers, basil, and pepper would be good for their nest in our neighbors grill. this is war. i am not going to say that we went to walmart that night and bought a BB gun, or that we put a scarecrow up, or as Becky likes to call it a scarerobin. we will see how these tactics work. we really need to ask ourselves "what would jack bauer do?". I feel like he would be r eally okay with what we are doing here. on the baby front we really have no news. there is still no baby and yes we are walking, yes i have had spicy food. this girl is stubborn. i can't imagine where she gets this trait from. she will come when she is ready or when she is forced by the doctor. monday we go back and have a non stress test, and an ultrasound to check my fluids. i sound like a car. hopefully we will not make that appointment. we will let you know. the pink gerber daisy above is BellaRose's (Bella Rose's) gerber daisy from her Mimi (is that what we are going to call you mom). here is the belly at 40 weeks and 3 days! as of 3:04 on sunday afternoon, mother's day, i am still pregnant. so i guess this won't be my first mother's day. i promise to keep you posted. i have a doctor's appointment tomorrow at 8:15. cross your fingers, be praying!!! 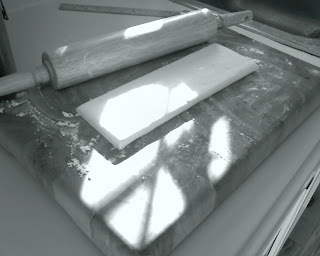 So i have no choice but to bake and try to take fun pictures with my cell phone since worth took the camera. 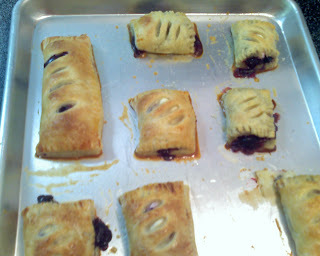 worth wanted cherry turnovers. 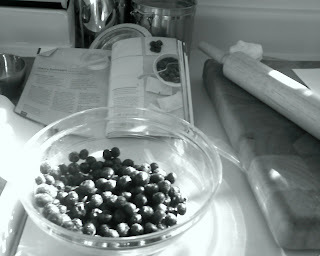 well they did not have frozen cherries at the store so i am making blueberry turnovers with cream cheese. he was not excited about this option so i will share with friends! i think that i will bring one to my favorite administrative professional. 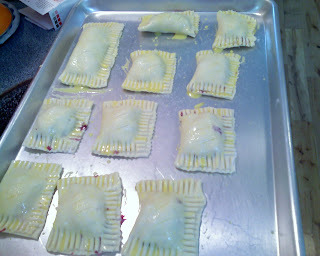 they are actually pretty good if i do say so myself. let me know if you, too, would like one. you can come over and sit on my back deck and get a tan with me and eat blueberry turnovers and wait for Bella Rose, BellaRose (which way, i just can't decide).